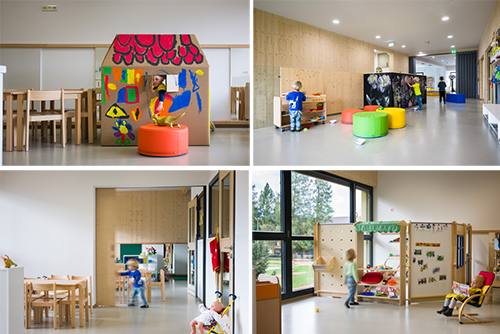 This impressive new kindergarten located in a small Slovenian village, Šmartno and designed by Jure Kotnik cleverly maximises on all available space and in providing an abundance of choice in activity for it's young users. Perhaps the most sought after activity for these lucky children is the tunnel slide linking the first floor with the ground. The stairs leading up to this slide not only enticing much exercise, but with the colours, numbers and blackboard wall also acting as a teacher and inviting interaction. (Note the adult and child-sized railings also). The building was finished remarkably after only 4 months and 12 weeks! Taking only one week to to put the whole building frame including the roof on site. This is due to smart prefabrication technologies allowing for the bulk of work to be completed off site and then assembled within the larch clad shell. Most furniture is handily propped on wheels, allowing for the easy manipulation of space (like for shared music time as shown below). 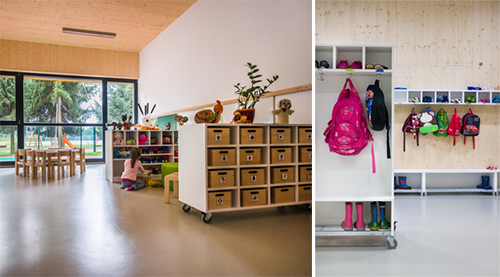 The architects Jure Kotnik Architecture have termed the centre a 'time share' kindergarten. The philosophy being that during 2-3 hours a day, children are able to roam and freely choose the activities and with whom they interact with. Thus promoting self-learning whilst maximising social (with all ages) and spacial interaction. In fact there are within the 1037 m2 kindergarten over 65 "activity corners" to choose from (including dress-ups, art, science-related activities, sport and music among many more). The centres' core incorporates a central multifunctional shared space which houses the stairs and slide (including a "badger's den hideout under for children to retreat to). The 'timeshare' concept extends also to the local community, with the upper level providing a hall for afternoon/evening community meetings, yoga, seminars, dance and pilates. A variety of surfaces and elements for sensory learning and play has been incorporated into the outdoors. With textures (mostly natural) including shells, sand, grass, bark, timber, stone and soft (red coloured) paving. The simple timber-clad 'box-like' form is punctuated with a yellow void defining the entrance into the building, while three round windows also add an element of fun to the centre's appearance. Care has been taken also to minimise the impact to the environment, with the choice of natural and locally sourced material and the orientation of windows and doors (opening to the south to capture all day sun and wind). To see more of Jure Kotnik's work see the colourful (and prefab) Kekec Kindergarten and a 'stickered' (also modular) container extension Kindergarten Ajda. Photos by Janez Marolt Photography.